The following was developed and compiled through great research conducted by Barry Ward, Ohio State University Extension , Production Business Management. Ohio is a diverse state agriculturally and cropland values and cash rents vary tremendously across the state. 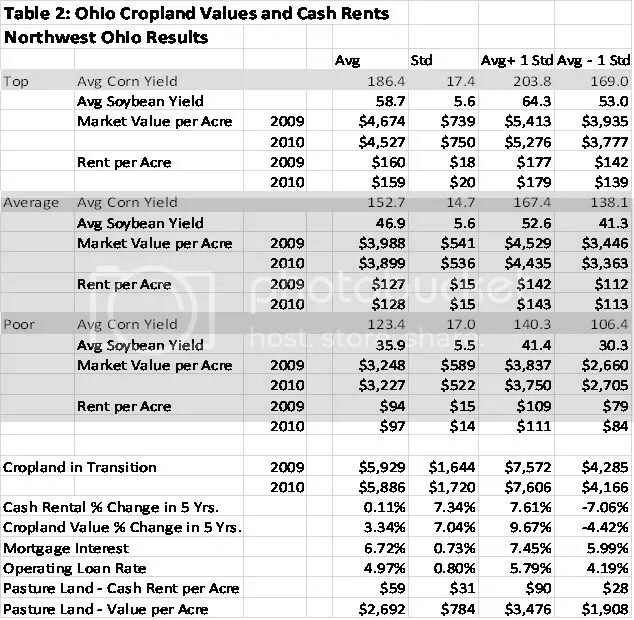 Generally speaking, western Ohio cropland values and cash rents differ a fair amount from eastern Ohio cropland values and cash rents. This is due in part to one of any number of factors including land productivity and potential crop return, variability of crop return, field size, field shape, drainage, population, and ultimately the supply and demand of rented cropland in an area. Ohio cropland values show signs of remaining stable to falling slightly in 2010 while this survey indicates cash rent levels will see little change in 2010. According to the Western Ohio Cropland Values and Cash Rents Survey bare cropland values are expected to decrease from 0.1% to 3.1% in 2010 depending on the region and land class. Cash rents are expected to range from a decrease of 1.5% to an increase of 3.19% depending on the region and land class. Ninety-five surveys were completed, analyzed and summarized. Respondents were asked to give responses based on 3 classes of land in their area; “top” producing land, “average” producing land and “poor” producing land. Tables show the average (Avg) (simple average) of each row, standard deviation (Std) of the data for that measure (measure of variability), average plus one standard deviation (Avg + 1 Std), and average minus one standard deviation (Avg – 1 Std). These latter two numbers reported indicate a range within which about two-thirds of the responses in the data for that measure will fall. Entry filed under: farm management. Tags: cash lease, cash rent, farm cash rent, farm lease, farmland cash lease, farmland cash rent, ohio cash rent.